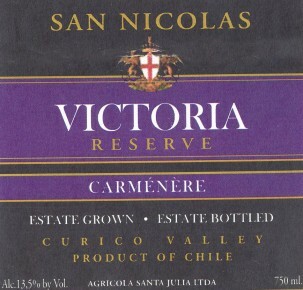 Carmenere is known as the “lost grape of Bordeaux.” It is deep red in color with hints of blackberry, raspberry, plum, tobacco, coffee, and cocoa on the nose that follow through to the palate. A well rounded wine that pairs well with pasta, meat sauces, roasted meats, and aged cheeses. Maceration on the skins for 21 days at a controlled temperature. Malolactic fermentation in stainless steel and barriques until completion. 4 months in stainless steel and 9 months in small oak barrels.